The Acer TimelineX employs a no frills—but hardly utilitarian—design that's simple and clean. Combined with a Core i5 Sandy Bridge processor, 13.3-inch display, Nvidia GT 540M graphics and Dolby audio, it's a solid, inch-thick package that only lightens bank accounts by $780. There are also 14 and 15.6-inch models that are oddly cheaper ($700 and $600, respectively) and less powerful (in the case of the 15.6-inch), but unlike the 13.3-inch model, do manage to pack a DVD-RW drive in there. All three models are available now. SAN JOSE, Calif., June 7, 2011 – Acer America today elevates its highly-touted Acer Aspire TimelineX series notebooks with a new sleek and stylish, thin and light design complemented by long battery life and the latest technology and new entertainment features, including Dolby Home Theater v4 Audio. Models are available now in North America. The Acer Aspire TimelineX Series is a best-in-breed notebook line that combines performance and portability in an incredibly beautiful and refined form factor. The notebook's upscale look and feel centers around its uncluttered, elegant design. The notebooks have a clean layout with a large touchpad and chiclet keyboard to promote both enjoyment and productivity. Available in three sizes – the 13.3-inch 3830T, 14-inch 4830T and 15.6-inch 5830T – the designs measure about an inch thin and are very light-weight. Powered by the latest second-generation Intel Core i5 and i3 processors with Turbo Boost technology, the Acer TimelineX notebooks deliver the performance that savvy consumers, students, small businesses and families have come to expect for running multiple websites, videos, email, games and more. In addition to providing superb performance, Acer PowerSmart Technology provides extra long battery uptime of up to nine hours on models with integrated graphics and up to eight hours for models with discrete graphics, as well as a long battery lifecycle of up to four years(1). The new Aspire TimelineX notebook PCs are perfect for entertainment thanks to new High- Definition audio support with Dolby Home Theater v4 Audio that delivers crisp and clear sound through its two built-in 3DSonic Stereo speakers and when connected to a home theater system. The notebooks also have HDMI 1080p output, so customers can use a convenient single cable connection to deliver HD video and audio to an external source. In addition, the notebooks have a USB 3.0 port for fast transfers. Plus, the port can charge USB devices even when the notebook is turned off. "From its inception, the Acer Aspire TimelineX Series has hit the mark in style, mobility, performance and battery life for ultimate PC productivity," said Eric Ackerson, senior product marketing manager, Acer America, "The new updated models build upon this proposition to provide even more value for our customers." The new Acer Aspire TimelineX 3830T, 4830T and 5830T models are ready to use right out of the box with Windows Home 7 as well as useful extras including Nook for PC, Adobe Flash Player 10.1, Adobe Reader, WildTangent Demo Games, Skype, Norton Online Backup, and Microsoft Office 2010 (preloaded for online purchase). The products are available at retailers now in both the United States in Canada. The Acer TimelineX Series starts at a Manufacturer's Suggested Retail Price of $599.99 in the U.S and $599.99CAD in Canada. 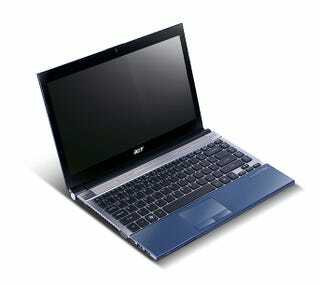 © 2011 Acer America Corp. All rights reserved. Acer and the Acer logo are registered trademarks of Acer Inc. Other trademarks, registered trademarks, and/or service marks, indicated or otherwise, are the property of their respective owners. All offers subject to change without notice or obligation and may not be available through all sales channels. Prices listed are manufacturer suggested retail price and may vary by location. Applicable sales tax extra. 1. Battery life varies depending on product specifications, computer settings and application or features launched. All batteries' maximum capacity diminishes with time and use.